Lock in a great price for Hotel Astoria7 – rated 8.8 by recent guests! Very welcoming staff at reception and you receive a voucher for a free welcome glass of wine in their restaurant. Room was very clean and had everything we needed. The shower was great, very powerful and no issues with hot water. The toiletries were “Rituals” which were lovely. The mini bar had a great selection and the Nespresso machine was a nice touch. We were on 9th floor and had a balcony. We couldn’t fault anything in our stay. The last night was quite a warm night, so much so that we had the door of balcony wide open but it was still very warm. We unfortunately got mosquitoes in our room as a result. I phoned reception and they switched the aircon on remotely. It’s 20-25 mins walk to the Old Town from the hotel, we caught the local buses there each day which is right outside the hotel, €1.75 each way. It was perfect. Staff at reception gave us a map of the old town with a list of places they recommend for food which was very handy. The staff is friendly, timely and helpful. The restaurant is amazing! Great location, tastefully decorated rooms, personal espresso machine. Friendly staff. Everything! One of the best rooms I’ve stayed in in Spain. Huge room, a lot of space and extra comfortable. The bathroom was spacious and very well equiped and had everything we needed and more. The hotel is excellent with a good price for the quality. Very nice looking boutique hotel near the center. Good location and vibes. 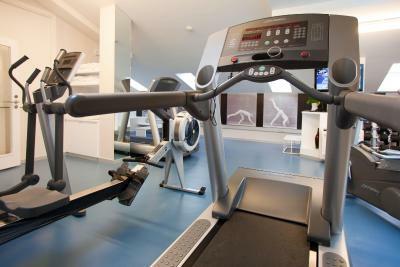 The hotel is well equipped with a gym and a bar. 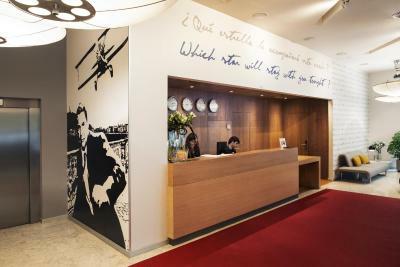 A great theme hotel focused on American movies and actors. 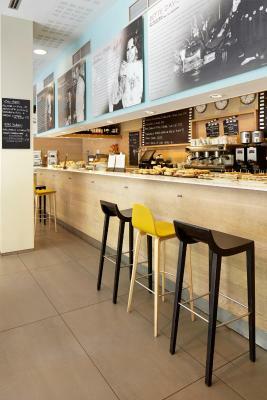 The theme carries throughout the hotel and its facilities. The staff is courteous and helpful. Our room and bathroom were clean and comfortable. The hotel bar and restaurant were super offering a broad menus at very reasonable prices. Breakfast buffet especially good. Other restaurants are available in the area. 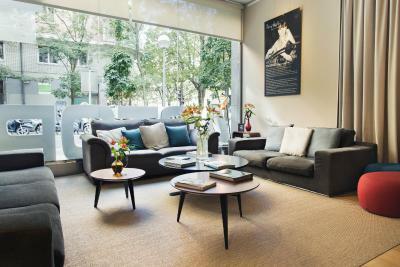 Highlights of San Sebastian are in walking distance or bus is available in front of hotel. Secure garage parking available at reasonable cost. 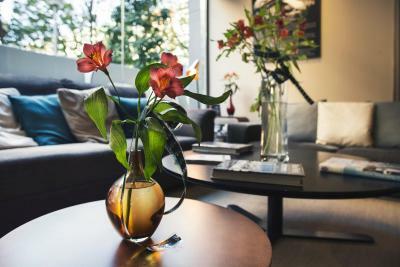 Modern, clean, comfortable room, location in a quiet residential area gives this a low key vibe but only a 15 minute walk ( much less by city bus which is easy to use) to the center. Bright cheery bar also frequented by locals and a fine breakfast room / cafeteria. And if you are in San Sebastián for a cocer match, also only a 15 minute stroll in the other direction. Everything! The staff, Food, accommodations, everything was perfect! Hotel Astoria7 This rating is a reflection of how the property compares to the industry standard when it comes to price, facilities and services available. It's based on a self-evaluation by the property. Use this rating to help choose your stay! 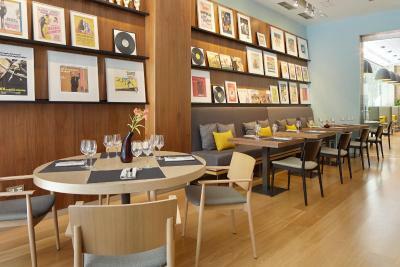 One of our top picks in San Sebastián.The Astoria7 is themed around cinema and the San Sebastian Film Festival. 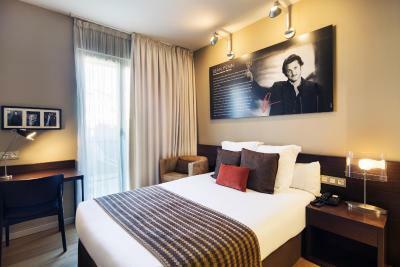 Each room offers free Wi-Fi, flat-screen TV’s and is dedicated to an actor or director who has visited the city. The stylish, sound-proofed rooms at the Astoria7 feature contemporary décor .Each air-conditioned room has satellite TV and a marble bathroom with a magnifying mirror. 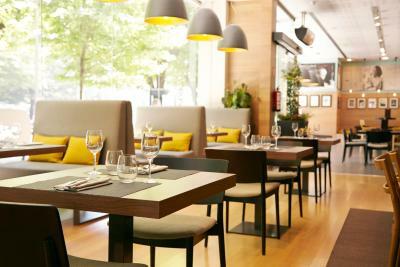 The Astoria’s restaurant is open for lunch and serves a range of Basque and Spanish cuisine. 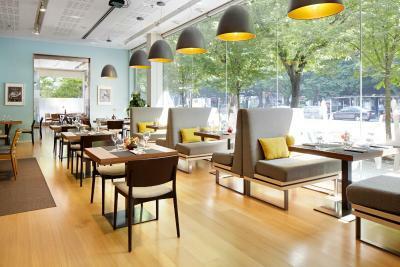 The café-bar offers a buffet breakfast and serves traditional Basque tapas, or pintxos. 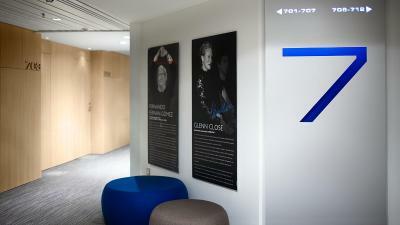 The lounge-library at Astoria7 has free internet terminals and a selection of books and films for guests. 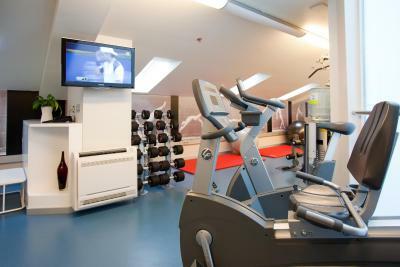 There is also a gym on site. When would you like to stay at Hotel Astoria7? This stylish, air-conditioned room is on the top floor and has a balcony. It includes free Wi-Fi, flat-screen satellite TV and a marble bathroom with a magnifying mirror. 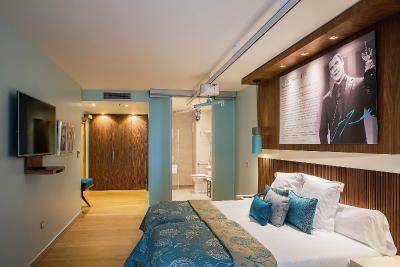 Themed around movies, each room is dedicated to an actor or director who has visited the San Sebastián Film Festival. Public parking is available on site (reservation is needed) and costs EUR 18.70 per day. This stylish, air-conditioned room includes free Wi-Fi, flat-screen satellite TV and a marble bathroom with a magnifying mirror. 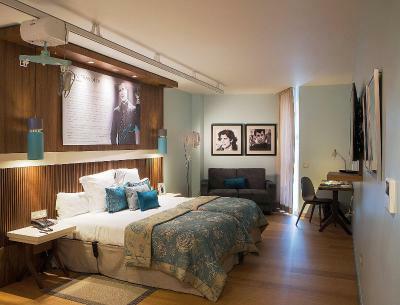 With a cinema theme, each room is dedicated to an actor or director who has visited the San Sebastián Film Festival. 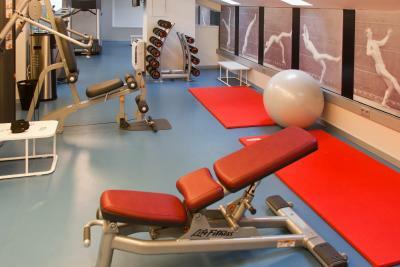 This spacious, air-conditioned room has a seating area with an iPod dock, flat-screen satellite TV and a DVD player. It has free Wi-Fi and a marble bathroom with a magnifying mirror, bathtub or shower and bathrobes. 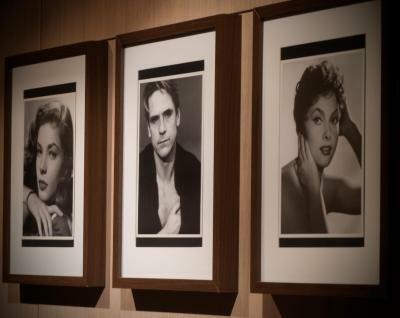 Themed around cinema, each room is dedicated to an actor or director who has visited the San Sebastián Film Festival. House Rules Hotel Astoria7 takes special requests – add in the next step! Hotel Astoria7 accepts these cards and reserves the right to temporarily hold an amount prior to arrival. I would have liked to have been able to control the aircondioning from our room. Room temperature was not easily controlled and I had to keep the window open to cool down the room. Cost of breakfast is a little bit to high in my opinion (18€). Cool hotel with supportive and nice staff. Rooms are unique as each one is associated to an actor/actress. Confortable bed, very clean and modern. Good quality breakfast with an excellent coffee (Nespresso). Very useful the parking under the hotel. It’s a bit far from the center of San Sebastián. Room was a little bit small with a tiny window. Trendy hotel with great restaurant downstairs, reasonably central, coffee machine in room, nice bathroom and bed. Expensive parking - same price for a motorcycle as a car (€18). Rigid booking conditions. Despite a change in my trip, the hotel refused to consider changing from a 2 to a 1 night stay. We chose the hotel mainly because of relative proximity to the Euskotren station about 500m away. We needed to get a very early train to Hendaia/Hendaye the next morning to connect to the TGV to Paris. 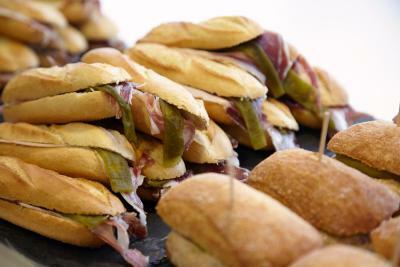 Therefore the location is OK for long-distance transport but less convenient for pintxos in the older part of town. It's a good location overall but the artistically textured pavements in San Sebastian are not easy with heavy 4-wheeled bags :) The hotel itself is modern and stylish and film-themed. Room was clean and modern. Due to tiredness and rain we actually ate in the hotel restaurant which was unusually nice! 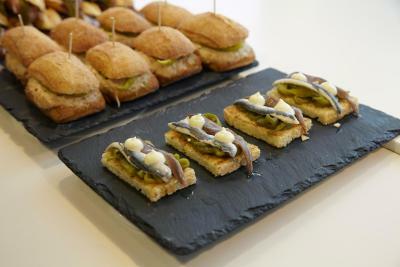 Of course if you come to San Sebastian you should go for pintxos in town, but the restaurant is much better than I expected and when we visited had free glasses of wine for guests and included glasses of wine with some meals. Service was very friendly also. Big comfy bed with lots of pillows, bathroom really spacious and very well equipped. Nespresso machine and a really well stocked mini bar. The breakfast was gorgeous and the cafe was excellent. Very bad smell around the hotel of boiling cabbage which made it difficult to open windows and cool the room down which was too hot. Very comfy bed @ - nice staff and reasonable location. 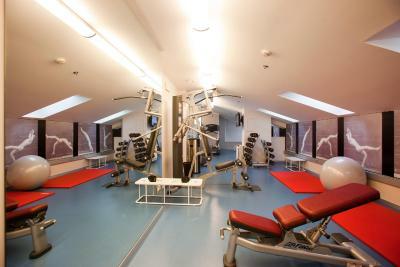 Unfortunately the gym is only available after 9h. 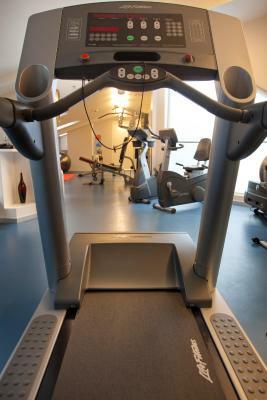 Don’t make sense when we are in a business trip and leave the hotel before 8h, and because of that you cannot make your daily exercises. very helpful staff, good food and great location.